Lavera is a brand that only provides you with the best nature has to offer. many products are even vegan. It is certified by the BDIH which is the toughest certification process anywhere in the world for making sure the products are natural and organic. We highly appreciate natural products, especially when you can have the natural and organic ingredients, but still don't have to miss any trend colours and can find a matching product for any skin and hair type. 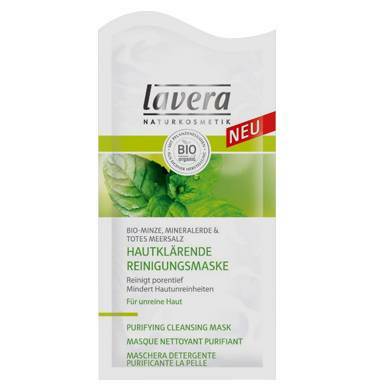 The lavera mint purifying cleansing facial mask is especially for oily skin types and minimizes skin imperfections. The organic mint refreshes and purifies the skind and the organic witch hazel and zinc have an anti inflammatory effect on the skin. and looking matte and radiant. We especially like the fresh odour and the purified feeling that we have on the skin after using it. The lavera mint purifying cleansing facial mask is a vegan product. The lavera apple shampoo & conditioner are products we have been using for a few weeks now and we are very satisfied. The odour is very fresh and you can really smell the apple, in a natural way. The hair is perfectly nourished and moisturised and remains neat, glossy and fresh, even over night, until you wash it for the next time. The hair feels healthy, strong and soft. When applying it, it is not as foamy as the artificial shampoos, but in a good way, as you can sense that you are doing something good to your hair and providing it with everything it needs. The apples come from an organic apple plantation in germany. 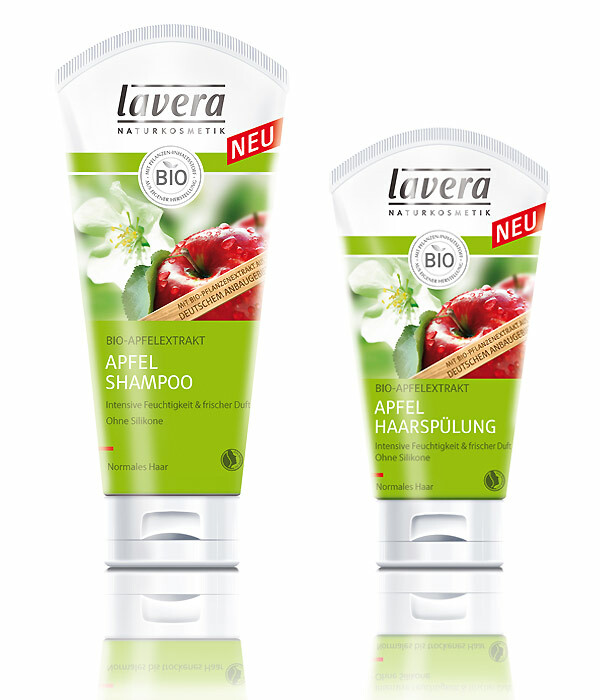 The lavera apple shampoo & conditioner are both vegan products. The lavera rose garden shower gel is another one of our favourite products. It is very good for sensitive skin, as it is very gentle and mild. We love the odour, as when you are using it in the shower, you feel like you are walking through a beautiful rose garden and that odour and feeling remains on your skin after you have washed it off. The use of the rose garden shower gel is like a little spa-oasis right in your shower, that is relaxing and harmonising. The skin feels perfectly cleansed, nourished and smooth. 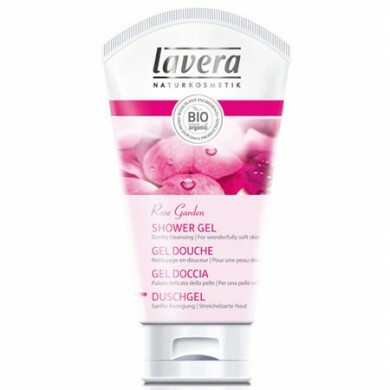 The lavera rose garden shower gel is a vegan product. 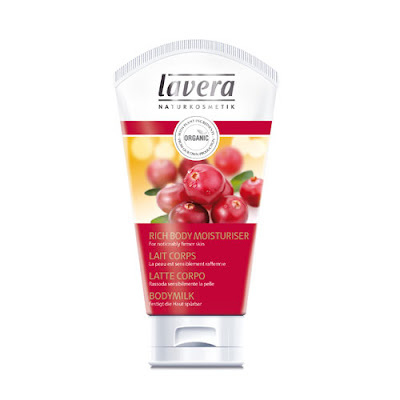 The Lavera rich body moisturiser contains antioxidant organic cranberry extract and organic argan oil, that delays the skin aging process, promotes cell renewal and helps protect the skin against free radicals & UV rays. and is absorbed quickly by the skin. The moisture produces a wonderfully refined and nourished feeling and leaves the skin smooth and refreshed. The Lavera rich body moisturiser is a vegan product. 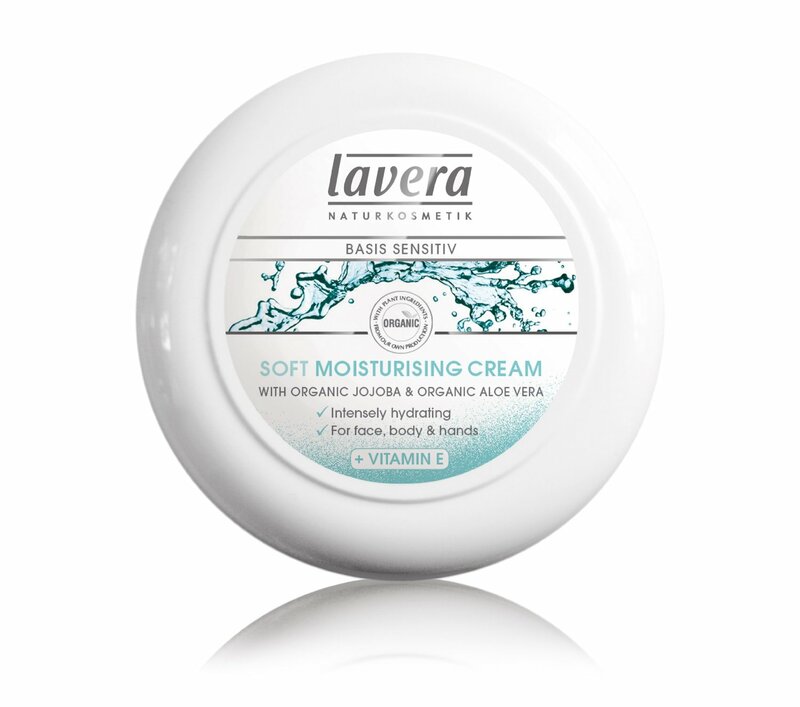 The lavera soft moisturising cream is a light and nourishing cream for all over the body, that soothes and hydrates all skin types. It contains organic Aloe Vera and Jojoba Oil, which leaves the skin nourished smooth and refreshed. The odour is very soft and pleasant. 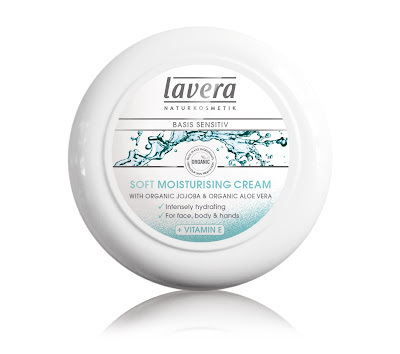 The lavera soft moisturising cream is a vegan product. The year 2014 is a very creative year for Lykke Li. She brings out her third album, features for the first time as main supporting actress in the swedish feature film "Tommy"and designs a collection for & Other Stories. The idea came up, when she was discussing wardrobe ideas associated to her next tour and concerts, with her friends, who are designers for & Other Stories. Talking to her about fashion must be very inspiring, as she has a very individual style, that suits her perfectly. So the idea of having her create a collection, to bring her idea of fashion and style close to the people, is obvious, and we are very happy to hear about that collaboration. We have seen her on stage many times, and her whole appearance has something special, almost mystical. The combination of her unique voice, poetic lyrics, how she moves and acts on stage, and her simple but still fashionable and distinctive style enchanted us again and again. 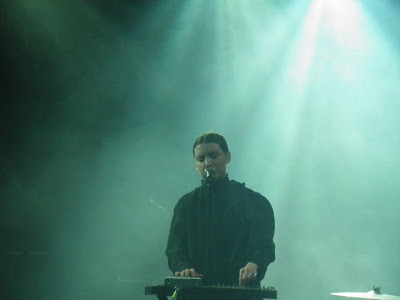 Lykke Li says about herself, that she is a nomad, she has been and still is traveling a lot, so she wants her wardrobe to be practical but still stylish, and suit her idea of fashion. The collection is going to fit these criteria and be an exact implementation of her sense of fashion and style. 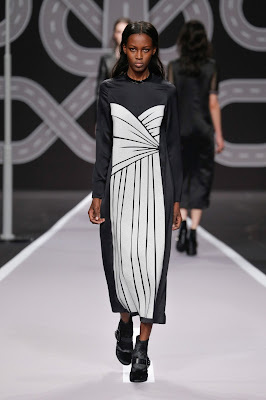 The main colour will be black, with elements of white, she designs ready-to-wear, accessoires, shoes, bags and jewelry. Behnaz Aram, ready-to-wear designer of & Other Stories says that the "(...)pieces are versatile, keeping the nomad perspective at heart. They can easily be dressed up or down, depending on what you feel like." We think Lykke Li is a fantastic artist, and we love individuality of the & Other Stories fashion, so we can't imagine a better collaboration than these two. We can't wait for more information to be released and see some pictures of the collection. It will be available online and in stores autumn 2014.
so make sure to stay tuned! The Nike Roshe Run is one of our favourite sneakers at the moment. It is incredibly comfortable and fashionable in a simple way. It is available in many different colours and materials. The Roshe Run won't let you down, for a day at the office, a shopping tour or even when travelling, you will always feel comfortable and look good. First the Roshe Run only came with a full mesh upper, which is extremely breathable and light. Now it is also available with a leather, suede and fabric upper. The inspiration to create the Roshe Run came from the practice and the concept of Zen, with it's simplicity that leaves nothing to be desired. You can also create your own personalized Roshe Run online, and there are endless possibilities due to different colours, patterns and materials to make your own fashionable Roshe Run. The Roshe Run is something we don't want to miss, everytime we wear it we are again amazed by how comfortable and stylish it is. Delphine Delafon is a Paris based french american designer. She designs only one bag, that comes in the sizes, small, medium, large and extra large. There is also a much smaller size, that can be used for the evening or for a night out. The bag is a bucket bag that closes with the help of a chain, like a pouch. 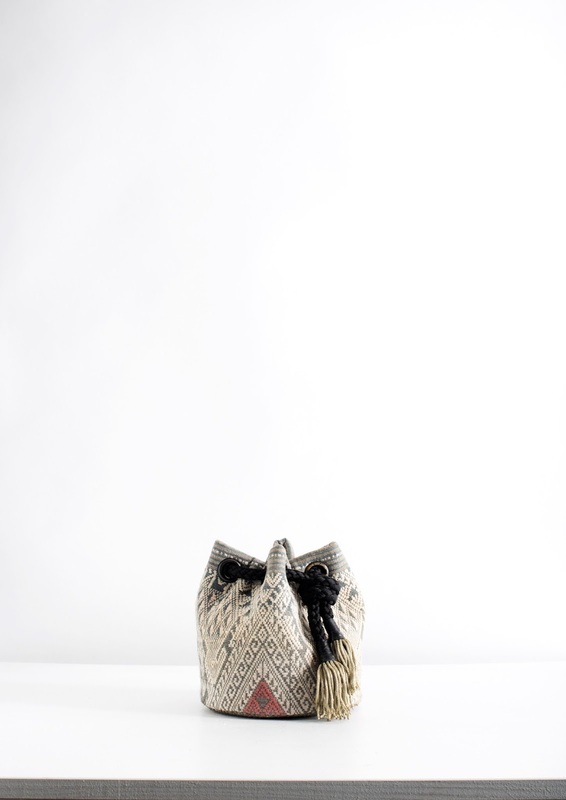 Each bag she creates, is another proof of her passion for the little details, to make every bag a unique piece that carries her signature. Even though she only makes one kind of bag, every bag is different to the other one and very special. 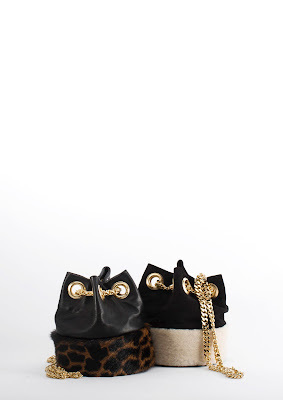 She uses different materials, like different leather, sheep fur, different kinds of fabric, and many more. 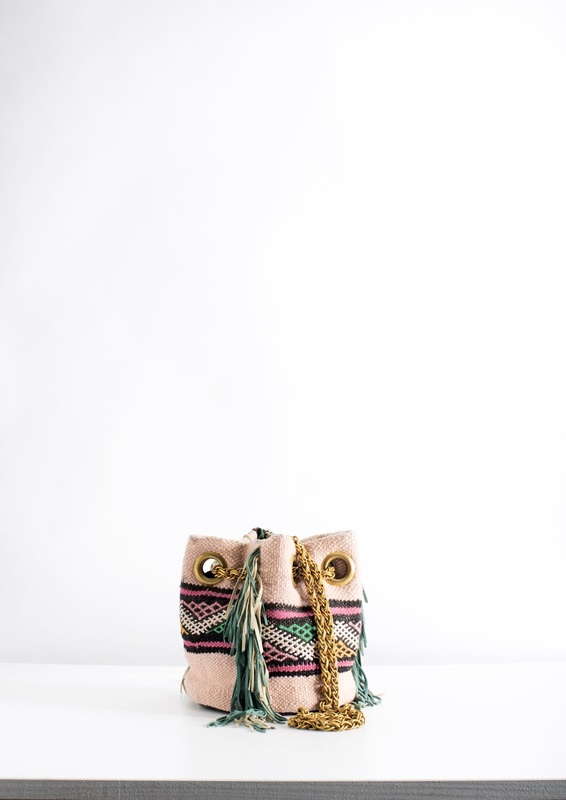 The bucket bag is stylish and at the same time very practical, as it can be opened easily and depending on the size you choose, you can fit everything you need in your bag. You can either carry the bag in your hand, or wear it over your shoulder, the chain of the bag over your shoulder is like jewelry and makes the bag the perfect accessoire to give the finishing touch to your outfit. What we like about these two bags, ist that they are very simple, in timeless black, and the golden details and chain make it classy and elegant. The combination of leather and fur gives the bag a rebellious chic, and the contrast between the two materials is an eye-catcher. The above described bags are Tailor made and are only manufactured upon request. The aztec pattern is very sought after these days, so whoever got this bag is very lucky and has the perfect accessoire for this season and probably for many years to come. If you take good care of it, it is also the perfect companion for the upcoming festival season. This bag also comes with the aztec pattern, the dark grey/black and white pattern is very chic and the small red part as a touch of colour is the cherry on top. Even though we like them all, this one is our personal favourite. Thanks to the many different styles, every woman surely finds one she likes and that can be her new fashionable constant companion. If that is not the case, you can visit her in her atelier, and she will make a custom-made bag just for you. 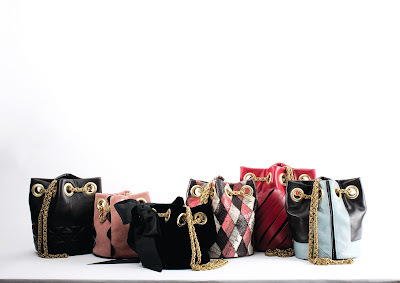 All the bags are designed and manufactured in Paris. We would like to introduce to you the Annick Goutal house, a very important brand on the world high perfumery market. The founder of the house, Annick Goutal, had a passion for perfumes, but not just perfumes, but fragrances that transport emotions, that create an atmosphere and mirror a situation, which will bring to any man or woman who wears it exactly that feeling she is describing. After she passed away in 1999, her daughter Camille Goutal and Isabelle Doyen, with whom she had collaborated since 1986 became the perfumers behind the new creations. The Annick Goutal house uses many natural ingredients of the highest quality, which makes their fragrances very luxurious. These are two of our favourite fragrances. Matin d'Orage: This perfume was created by Annick Goutals Daughter Camille in 2009 after she returned from a trip to Japan. She loved the japanese gardens very much, and the fragrance is inspired by the smell of a japanese garden after the rain, when a fresh breeze brings you the the scent of spring and blossoms. It is a very soft, dreamy but still fresh fragrance, that is very calming and at the same inspiring. It is the kind of fragrance, that you notice immediately but not in an intrusive way. The Matin d'Orage contains notes of Ginger, Magnolia, Jasmine, Lemon and Green Shizo. For us there is also a touch of orange blossom, and we feel like it really has the fresh scent of clean air after a rain. Le Chèvrefeuille: This is the perfect spring / summer fragrance, as it creates a carefree and playful atmosphere, like a moment in the sun, in a garden full of beautiful flowers and harmony. It was created as an homage to Camille's happy days in her childhood, in the family's house in Provence. If you put this fragrance on, it makes you smile and maybe brings back some of your memories from the past too. Le Chèvrefeuille contains notes of honeysuckle, lemon, jasmine, narcissus and petitgrain. The fragrances are all very unique and unforgettable. The names already tell you what the fragrance is all about, and for us all of the names are chosen perfectly for the fragrances. 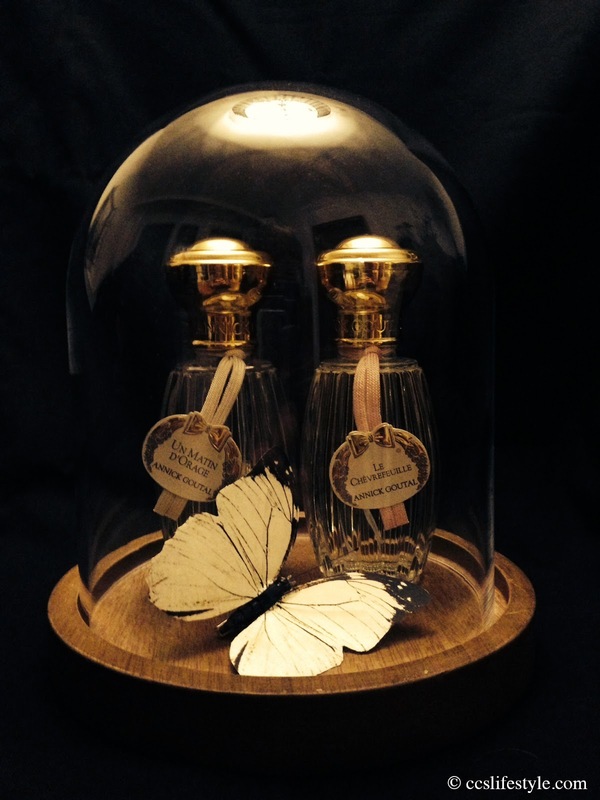 The Annick Goutal perfumes are only available in selected stores or online. 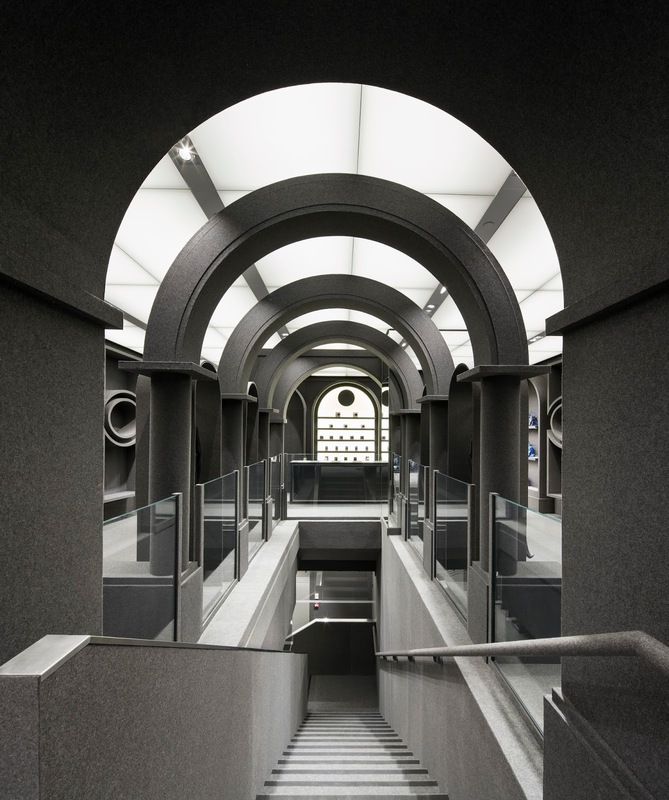 In december 2013, Viktor & Rolf opened their very first flagship Boutique in France, at 370 rue Saint-Honoré in the first arrondissement in Paris. Rue Saint-Honoré is the perfect location for the Boutique, because this is a street that everybody who has a passion for style and fashion will visit, it is also our favourite street and we go there every time we stay in Paris. 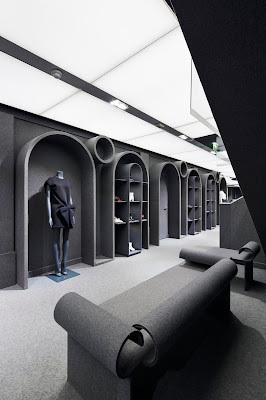 The Boutique's design is very classy and elegant, with grey shades which you also find in the latest collections. It is an elegance that does not attract attention with an overload of things, but with simple but detailed and artful design, which is our favourite way of standing out. We are very impressed and think the design of the new Boutique really does the brand justice. The romanesque round arches make the room look bigger and are at the same time elements of partition. That way the boutique is very open and spacious, but still intimate. The benches with curve elements cohere with the round shaped display shelves and generate a unity that is elegant and noble. 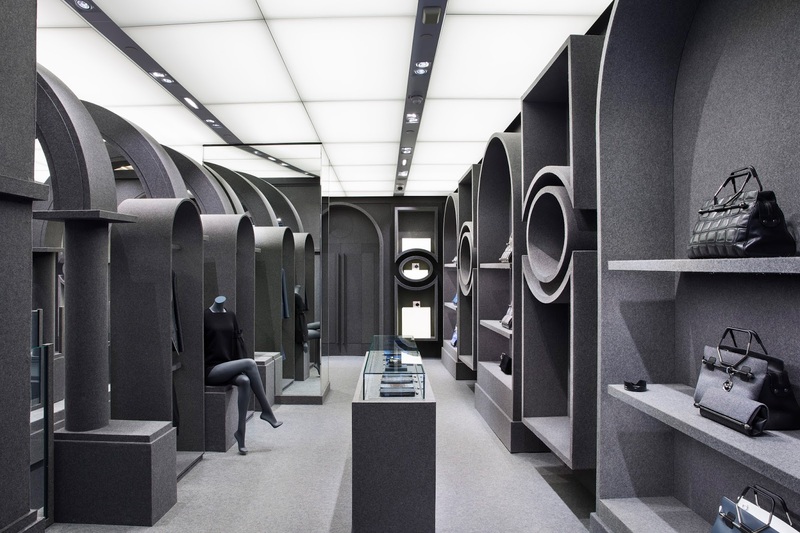 Walking through the two-storey boutique, you feel like you are in a fashion gallery, where you can admire the beautiful pieces of all Viktor & Rolf brand lines, women's ready-to-wear pre and show collections, menswear, perfumes, accesoires, handbags, shoes and eyewear. The brand's haute couture collection is available upon request. The mannequins adopt a very elegant attitude, which completes the picture of a noble and elegant fashion gallery. 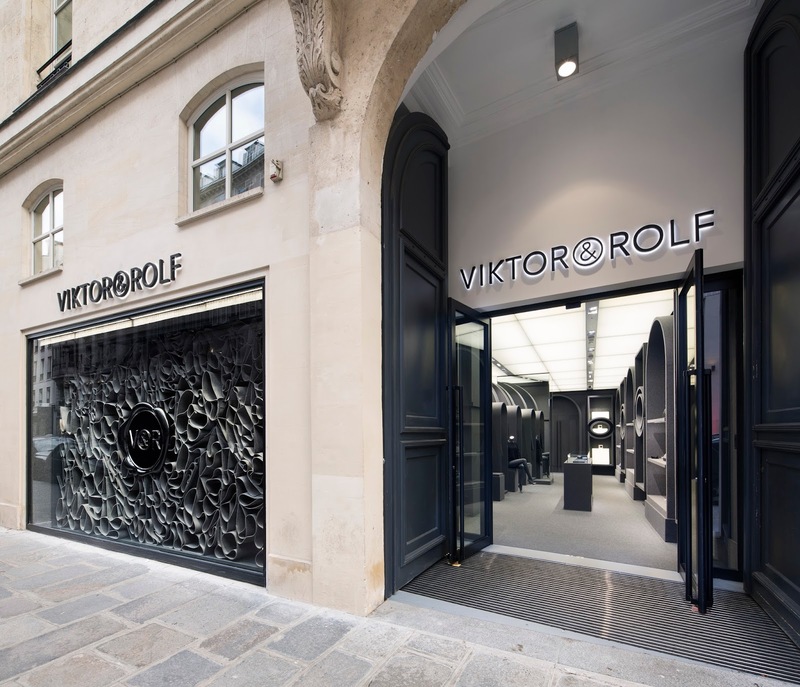 The Viktor & Rolf boutique is definitely something you have to visit when you are in Paris, and we are sure you will fall in love with the one or the other piece. 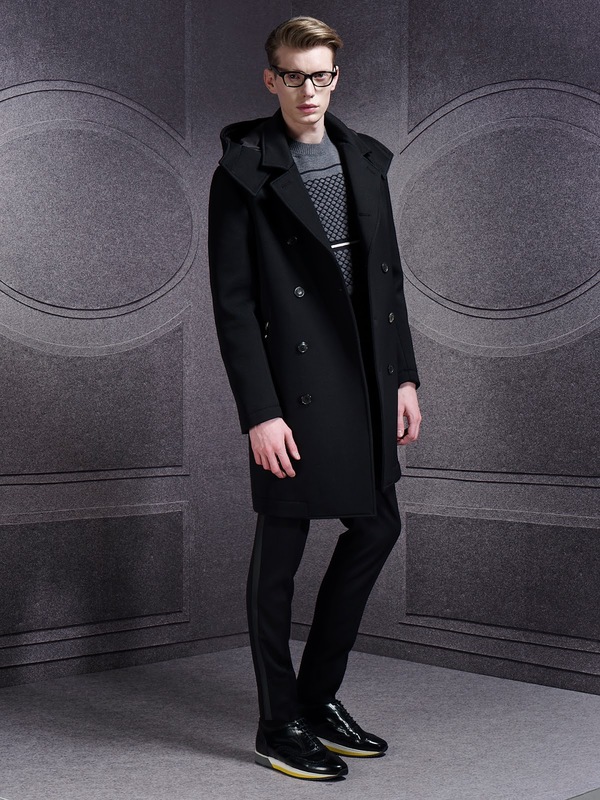 With the Viktor & Rolf F/W2014 ready to wear collection, comfortable is ready for the runway. They managed to transform something as cozy as a knit sweater into a very elegant piece. The knit stitches you find in most of the pieces, sometimes as knit detail and sometimes just as a print. The cuts are very masculine and over-proportional, but still some pieces flatter the silhouette due to artful feminine prints. The collection is mainly done in grey shades, with black and white and some pieces in a bright coral red and light pastel blue. The footwear is mainly a black leather shoe with a belt with a buckle around the middle of the shoe, that gives the shoe a surreal touch. It looks very comfortable and matches perfectly with the cuts of the collection. 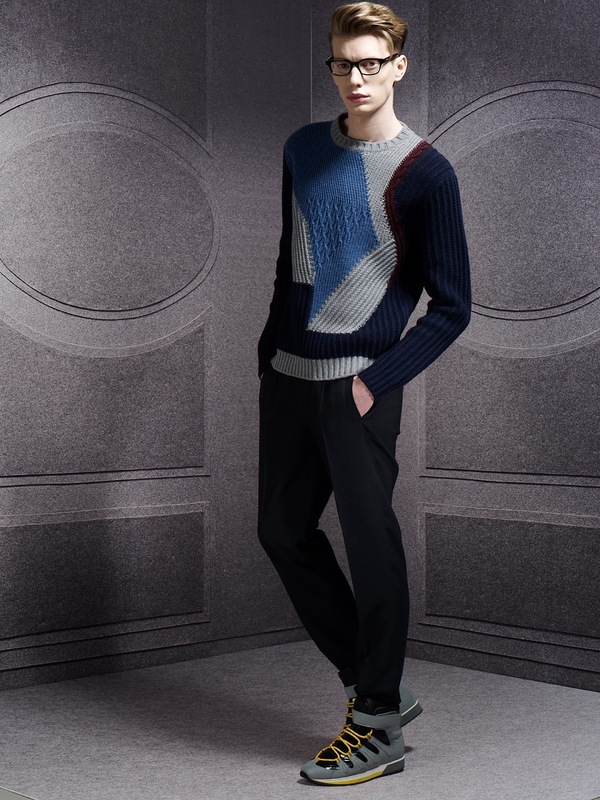 The cut of the pants is very masculine and the print on the sweater creates an strong look. The knit collar is not a part of the outfit and just for the show, but for us it gives the finishing touch to the look. 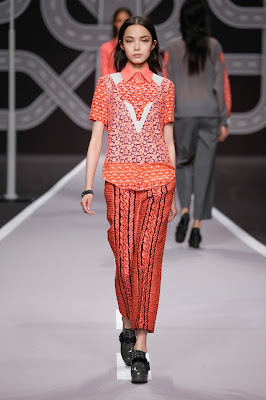 This look is very artful, with the loose knit detailed pants and the patchwork flower print on the shirt. The white v-shaped detail gives the shirt a feminine touch. The print on this dress accentuates the female figure even though the cut is very loose. The print reminds us of an ancient greek dress. The runway is an empty street, with a musician standing next to a street lantern, who plays the perfect music to this show. We love the atmosphere this scene creates for the whole fashion show. 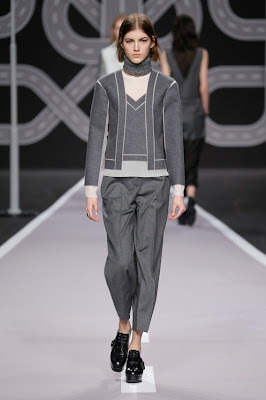 The idea of combining casual elements, like a knit sweater, with elegance fascinates us and creates looks we like a lot. This idea also appears in the choice of fabric, as the combination of rather "heavy" fabrics (like wool) and more "light" and fluid fabrics create a contrast that is outstanding. The Viktor & Rolf Monsieur Autumn / Winter 2014 collection is all about chic college style. 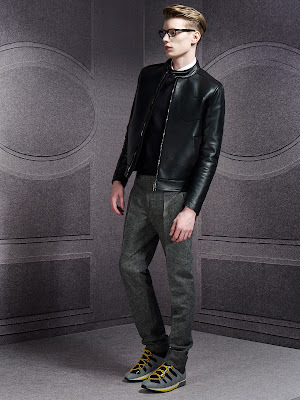 Classic menswear combined with sporty elements, it's a look that is equally stylish, elegant and casual. The trousers with a slim cut and the sweaters with asymmetric patterns give the look a modern touch. Main colours are grey and navy blue, but also with details of mustard, azure and burgundy red. The choice of colours and material and the love for the detail make the collection very luxurious. We like the collection a lot, especially the combination of classic elements with modern patterns colours and cuts. It is very fashionable and exactly what is in demand these days. The Versus Miami watch that was presented at the 2014 Baselworld is a very modern and fashionable timepiece, that combines classic Versace elements like the safety pin or the lion with edgy elements like the studs on the leather strap. At the Baselworld 2014 we got a Versus Miami as a present, and it really is an amazing watch! It is very comfortable to wear and adds that certain something to every outfit. Also it can be combined very well with other jewelry, without looking too heavy. The Versus Miami comes with an extra leather bracelet in shiny black leather without the safety pins and studs, for a more simple but still very stylish look. The Versus Miami comes in six monochromatic versions in the colors black, white or red with either a IP yellow gold or a stainless steel case. Miami, the city that is known for fashion, glamorous parties, and style, is the perfect name for this watch, that gets you ready for a good night out aswell as for any other occasion. Bomberg watches are for the confident, modern man, who wants to rise above the masses and has a passion for live and style. You can see in their advertisements, that the new collections have a rebellious and fashionable touch, and also the showroom was not like the other watch companies showrooms, but more like the apartment of a south american rock & roll star, with large leather couches and wooden detail. The atmosphere in the showroom was very casual and we felt comfortable immediately. The 1968 collection are asymmetric watches that are an eye-catcher because of their special shape, but still as classy as a classic watch. It is a very stylish watch with a strong design, that can be worn for business, to complete your everyday look or also for a special occasion. If you own one of these watches, you have the perfect accessoire to give the finishing touch to almost any look. It is very comfortable to wear. The BOLT-68 collection is very innovative and convincing with the perfect mix of style and class and endless possibilities to wear it, due to a mix and match clipping system. The BOLT-68 collection is based on quality swiss movements, the watch's case can pivot and slide back, which opens you a whole new world of possibilities to use it. You can either combine it with one of the many different watch straps (different colors, shapes, with skull details and many more), or wear it on one of Bombergs fashionable watch chains. There is a simple chain available, or also (very typical for the brand) chains with skulls, where the first skull has amethysts as eyes. This stone is the perfect choice, the amethyst being a stone of power and also protection, which is a perfect fit for these powerful watches. The BOLT-68 collection includes 25 high-quality stainless steel models, available as Automatic Chronograph, Quartz Chronograph or 3 Hands GMT quartz. The watches are available in many different colors and as mentioned above, there are endless possibilities to combine and use them. Some are simple, elegant and classy, others have a more rebellious chic. Certainly this is a brand for the man who's not afraid to show his style and passion, wearing a watch from an outstanding modern brand with strong and special designs. The DRIVER'S WRITS is a watch for the modern and fashion conscious man with a passion for cars and their design. The DRIVERS watch was designed in dependence on the elements of a car, as you can see very good on the picture. The watch strap reminds of peccary gloves, with the little holes that allow your skin to breath through the watch strap, and the clock face elements remind of a cars speed indicator. We liked the rectangular architecture watch a lot (right watch on the picture), because of the retro look and the 30ies look. 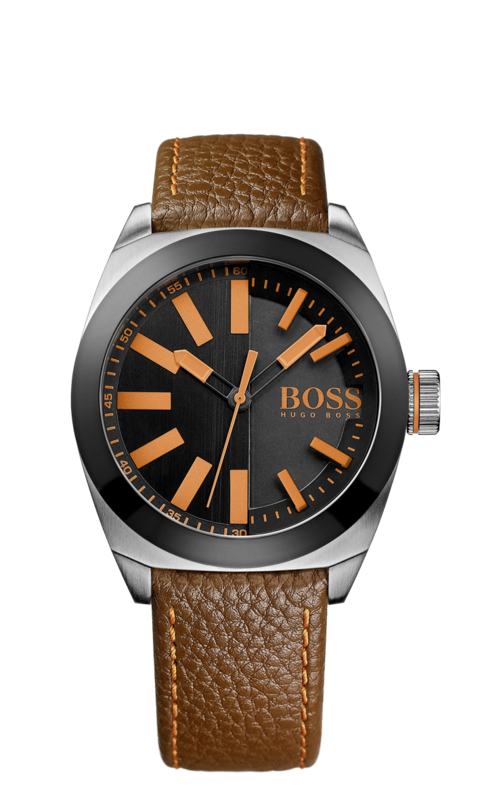 It is a watch for men of every age, as it can be worn for nostalgic reasons or also because one just has a flair for the style of the 30ies. Even if just because of the shape, the watch is an eye catcher and can be worn as a statement of style, casually and also for special occasions. Also we like the crocodile embossed leather bracelet a lot. 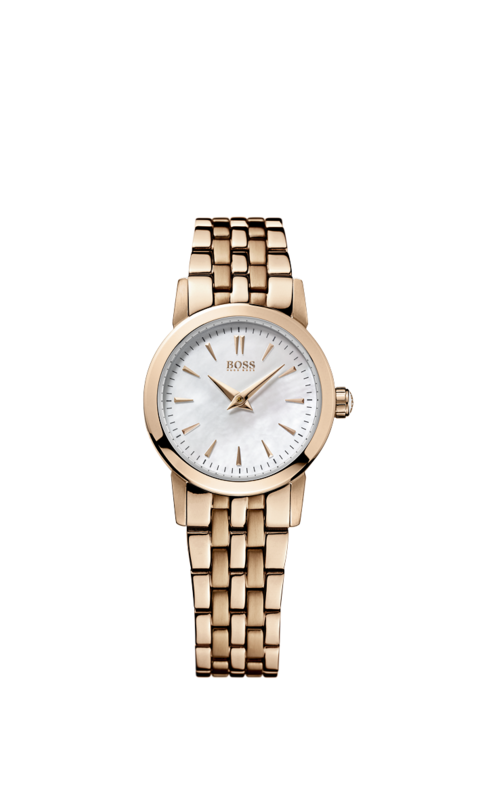 On the left side, you can find this seasons trend colors as the pastel-colored clock face and the rose-gold details, which is also a beautiful watch. 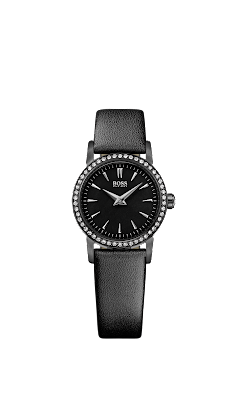 For the women there is the very elegant SLIM ULRA MINI watch which is a small version of the SLIM ULTRA model. It is very chic and can also be worn casually or for special occasions. It is a watch for the autonomous and confident women who knows what she wants in life and knows how to make an appearance. The new watches from BOSS orange, have the names of Metropolises, so this is the perfect watch for the young and open minded who like to travel around the world. This is the model "London" which we liked immediately, because for us this watch represents London very good, with the leather strap, for the vintage touch and the neon colors which for us stand for the energy and passion of the city.